Rodent-faced (see cover) British thesp Chris Barrie of Red Dwarf fame is back, taking a look at some of the engineering marvels that shaped the 20th century, usually whilst clad in tweed and blanching every time he is required to climb into an apparatus capable of attaining speeds of greater than 15 km/h. 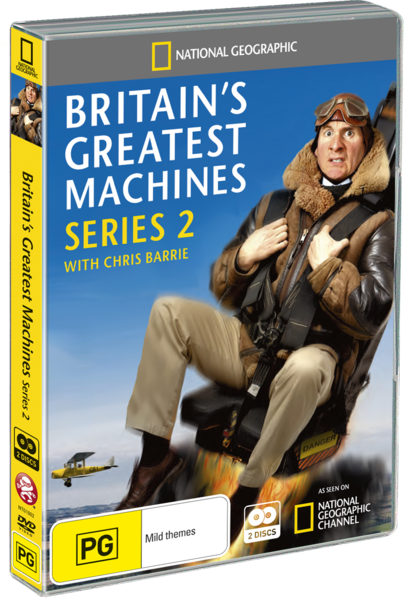 Pleasingly for fans of both sequentiality and old-timey motor vehicles, this episode features some of the engineering highlights of the ‘Roaring 20s’ such as the De Havilland Moth, a light aircraft which helped pioneer the commercial routes still in use today. Barrie does plenty of roaring himself in a period Bentley, then takes part in a race between a 1925 Brough Superior motorcycle and a plane. Spoiler alert: the plane wins. This one, of course, focuses mainly on wartime technology, most notably by exploring the vehicles of the Auxiliary Fire Service and High Speed Launch 102, England’s first high speed rescue boat. He also races around the English countryside, something of a staple of the series, this time in a strikingly named contraption known as the Daimler Dingo, and dabbles with the steampunk version of the minigun. The title of this episode pretty much sums it up. In this episode ‘TV icon and vintage machine enthusiast’ Barrie delves into the rail’s history, looks at some steam engines, and the like. By this point I was so sick of the witless twit I wanted to leap off the Trevithick Puffing Devil, take a ride aboard it. Look, the series is alright. It’s a harmless, occasionally insightful bit of British mutual backslapping and a chance to put on anorak and hanker for the ‘good old days.’ But I used up all my politeness in my review of season one and can no longer feign interest, so I’m going to stop here. Once again the series has been expertly shot and edited and comes across strong in an anamorphically enhanced 16:9 widescreen presentation. Audio is in the usual documentary format, ie. a perfectly respectable DD 2.0. Once more there are no bonus features.